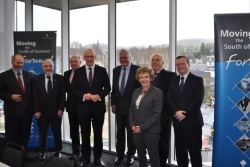 Scottish Government ministers John Swinney MSP and Fergus Ewing MSP met the South of Scotland Alliance on Wednesday in Galashiels to discuss a range of key economic issues for the area. Mr Swinney, Deputy First Minister, and Mr Ewing, who is Cabinet Secretary for Rural Economy and Connectivity, met our senior representatives alongside Dumfries and Galloway Council, Scottish Enterprise and the private sector - which all make up the South of Scotland Alliance – in the town’s Transport Interchange. Discussions were held on a variety of topics specific to the south of Scotland, including the importance of broadband coverage and the impact of Brexit on agricultural and rural policy, as well as regional funding. Updates were also provided on the South of Scotland Enterprise Agency (SOSEA) and Borderlands Inclusive Growth Deal. SOSEA will focus on strategic economic development, providing a voice for the south of Scotland and addressing challenges facing the area’s economy. An interim partnership for the SOSEA has been created to prepare the ground for the establishment of the agency in April 2020. The Borderlands Inclusive Growth Deal brings together the five cross-border local authorities including Dumfries and Galloway Council and Scottish Borders Council and is focused on ways of making the area more attractive to investors, visitors and those who may wish to relocate. “This was an important meeting for the Alliance, given the significant progress which is being made on the South of Scotland Enterprise Agency and Borderlands Inclusive Growth Deal. “Working alongside the Scottish and UK governments, both these partnerships offer opportunities to improve the level of investment in economic growth, enterprise, skills and innovation across the south of Scotland. “Other vital topics which affect communities across the area, from St Abbs to Stranraer, were also discussed, in particular the current Digital Scotland Superfast Broadband rollout programme. “While many more businesses and homes in the south of Scotland now have access to superfast fibre broadband, the overall position in south of Scotland is still behind that of other areas. We raised this issue with the Cabinet Secretary and further meetings with civil servants are planned to look in detail at delivery across the region. “We’re delighted to be working so closely with our partners in the south of Scotland to ensure inclusive economic growth opportunities across the area are fully exploited. “For example we recently awarded R&D funding to DuPont Teijin Films in Dumfries, and equity investment for Ryboquin in Selkirk. The announcement on Tuesday from Young’s Seafood regarding the future of its seafood production site in Annan was also a major item of discussion at the meeting. The Scottish Government and Dumfries and Galloway Council agreed that they should work in partnership to explore all possibilities for dealing with this issue. “The meeting considered several important issues for the south of Scotland including broadband and mobile coverage and the influence of Brexit on industrial and agricultural policy. “We welcome the positive reaction from the Scottish Government on Young’s Seafood. They recognise the scale and seriousness of the problem for the staff and the community of Annan and the importance of prompt, focussed action. Time is of the essence. “We want all of Scotland to flourish. That is why we have invested over a billion pounds in the south of Scotland to ensure local people, communities and businesses have public services fit for the future. “We have invested in schools, colleges, universities and hospitals, as well as roads, rail, regeneration and digital connectivity, helping to develop an infrastructure which enables inclusive economic growth. An image from the meeting is available at our Flickr page. More information about the South of Scotland Alliance is available.